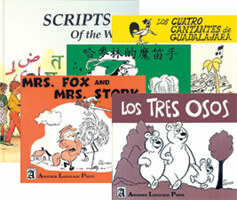 AIMS Books Specializes in Spanish Language Books. Welcome to AIMS International Books, Inc.
We are proud to be celebrating 22 years of business. We import and distribute a wide range of books in Spanish as well as a growing assortment of children's books in 39 different languages. In our catalog we offer a comprehensive collection of children's books in Spanish from preschool to young adult titles. We carry classic and contemporary literature by native Spanish and Latin American authors. Reference books, nonfiction and popular titles translated into Spanish are also available. Another Language Press offers introductory books to foreign languages. These sets of fairy tales and fables cannot be surpassed for their simplicity, flexibility and popularity as a teaching tool. Available in 17 languages. Posters, T-shirts, Magnets, Stamps, and more. We offer a full line of educational products. Featuring the popular "How Are You Feeling Today?" characters by Pulitzer Prize winning artist Jim Borgman. Available in 19 different languages.